Beats Antique – "Skeleton Key"
Fans of worldly and electronic music, scoot a little closer to the speakers. Using a fair amount of Middle Eastern styles, jazz, afro-beats, downtempo, electro, and dubstep, Beats Antique is a unique group with an extremely distinct sound. Using their vast musical backgrounds the three-piece Oakland,CA based band fuses old and new school elements together. In their recorded work and live performances they tend to prefer to use live acoustic instrumentation along with electronics to create an even more dynamic sound and visual experience. The trio's latest teaser single "Skeleton Key", released not too long ago is pretty dynamic tune in that it isn't a standard looped electronic track. Within the song are distinct changes that gives it a variable, evolving characteristic yet with an overall cohesive flow. Starting off with electronic effects and a Middle Eastern string instruments, it escalates slowly into a dubstep drop. Throughout the song, there are sections where it seems that each element of the song gets its own spotlight, which I dig entirely. "Skeleton Key" is a mid-tempo paced song that has full of energy and personality. Hands down, "Skeleton Key" is one helluva banger. Beats Antique has yet again hit the bulls-eye. 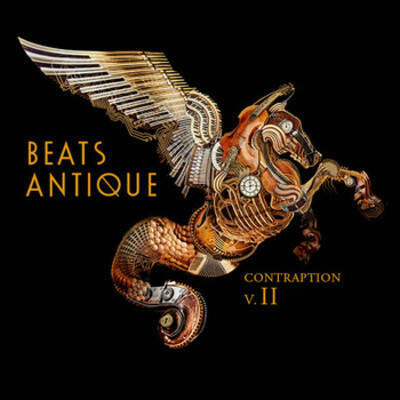 The single will appear on Beats Antique's upcoming and long-awaited, Contraption Vol. 2 which will be available September 18. Stream "Skeleton Key" below and grab a free download HERE.